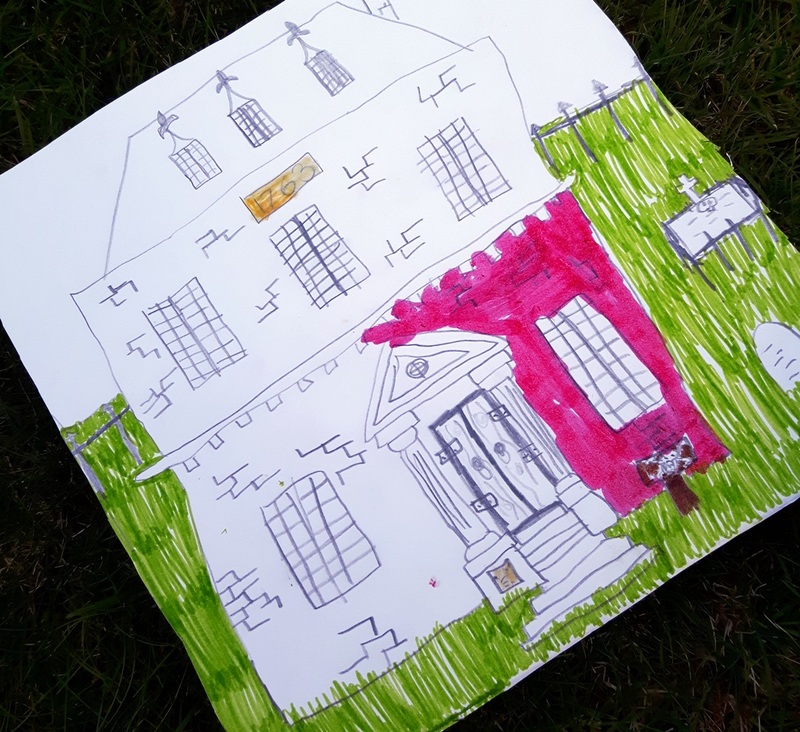 Over the summer I went through some very old pictures that I’d drawn – things from the age of seven upwards – I make no apology for these unhappy crimes against art that I now present. 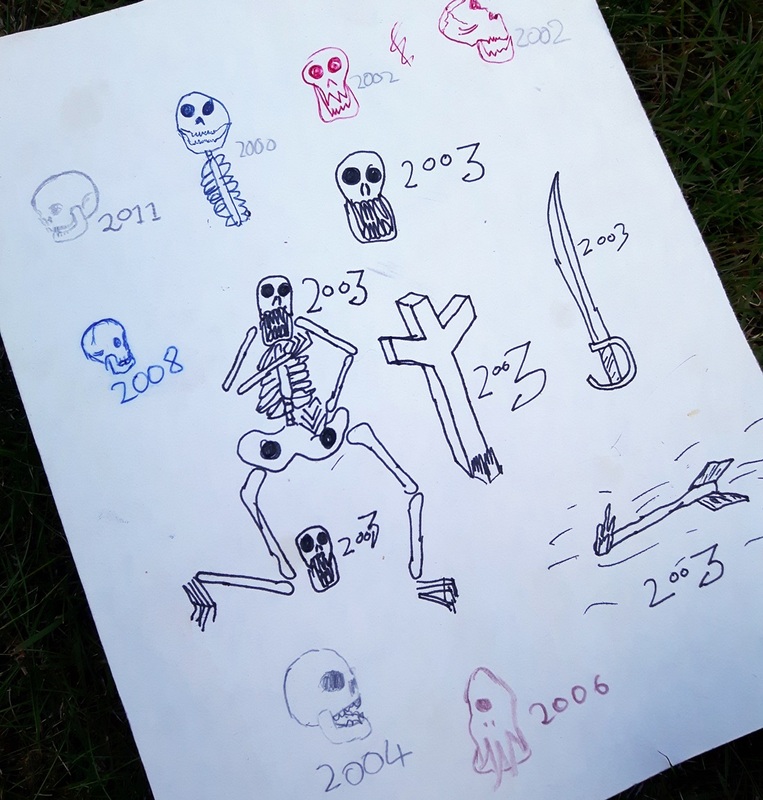 I’ve got a few scraps of paper like these – back when I was in primary school I wrote a lot of short horror stories, so regularly illustrated them with ghosts and skeletons. This scrap of paper ended up getting expanded a bit, and whenever I’ve found it in the past I’ve added a new drawing. The oldest one here – 2000 – would have been when I was eight. 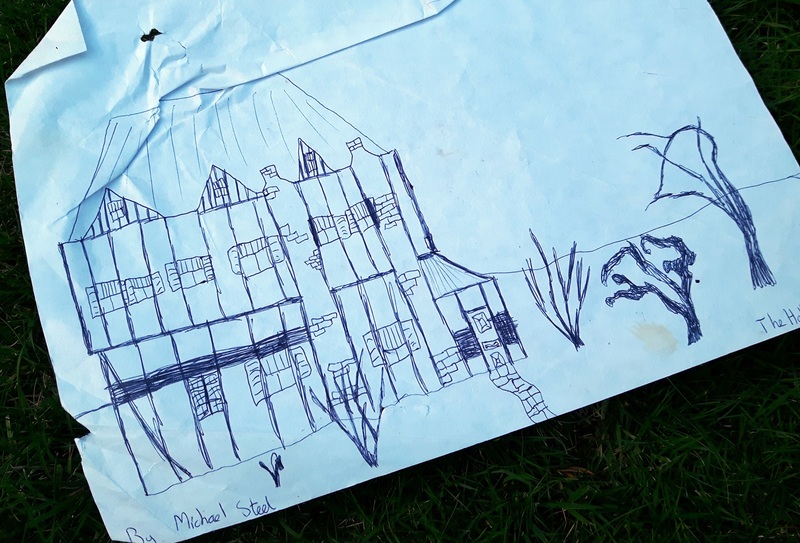 Here’s a haunted house from when I was about ten. And here’s one in colour – probably when I was about the same age. This drawing is very frustrating. 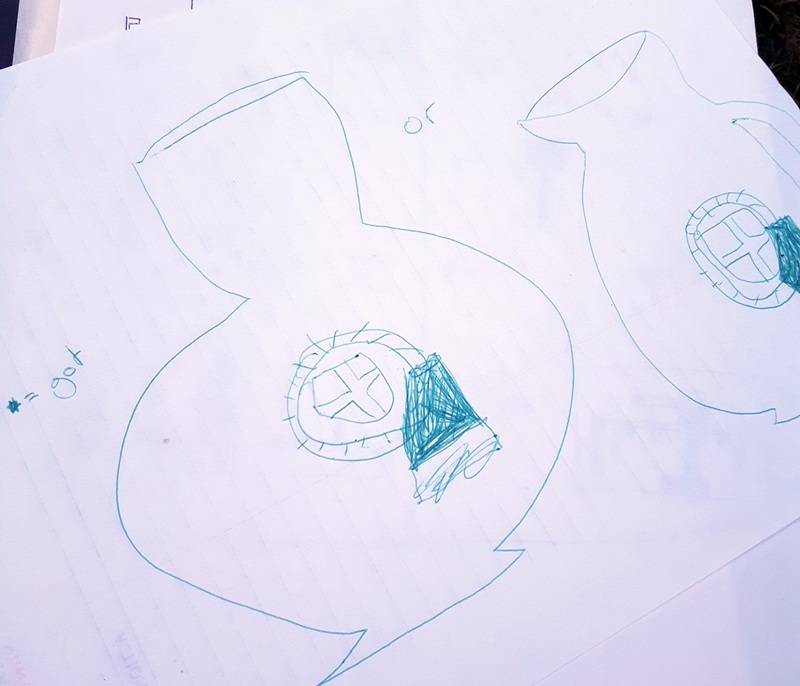 I found a piece of the crest from a Bellarmine Jar when I was nine or ten and this is a drawing of it – I liked to record my finds this way. I’ve been searching for what happened to this interesting piece of pot for years and had hoped to find it this summer, but it’s still missing. 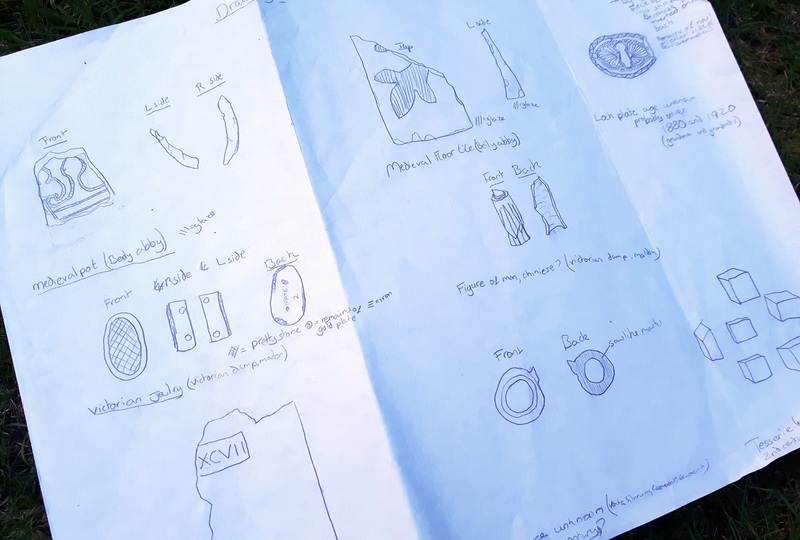 This illustration of odd finds is something I probably drew when I was about twelve, some of these are missing too. It shows a piece of 17th century pot, a medieval floor tile from Beeleigh Abbey, a lock plate from my grandparents’ house, a piece of jewelry and a statuette from a Victorian tip, a hypocaust tile and tesserae from Caer Went, and a brass loop from Duxford aerodrome. 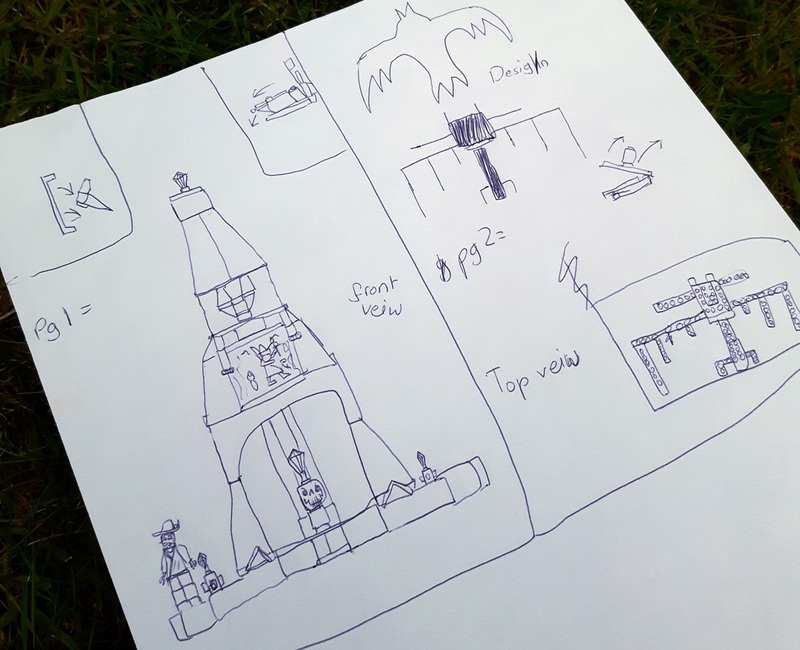 Getting into more technical drawings, this is something I must have drawn when I was ten or so. It’s a plan for a Lego model! And something even madder: my granddad gave me and my brother some old cupboards and a broken lawnmower one summer to build something out of. 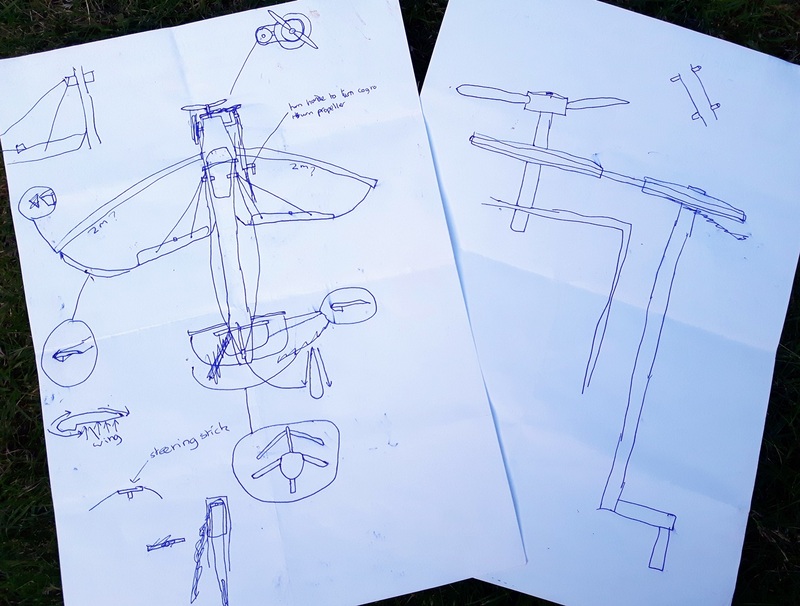 Here’s a plan for the plane that we attempted to make, with an explanation of the system to make the propeller turn and control the ailerons. 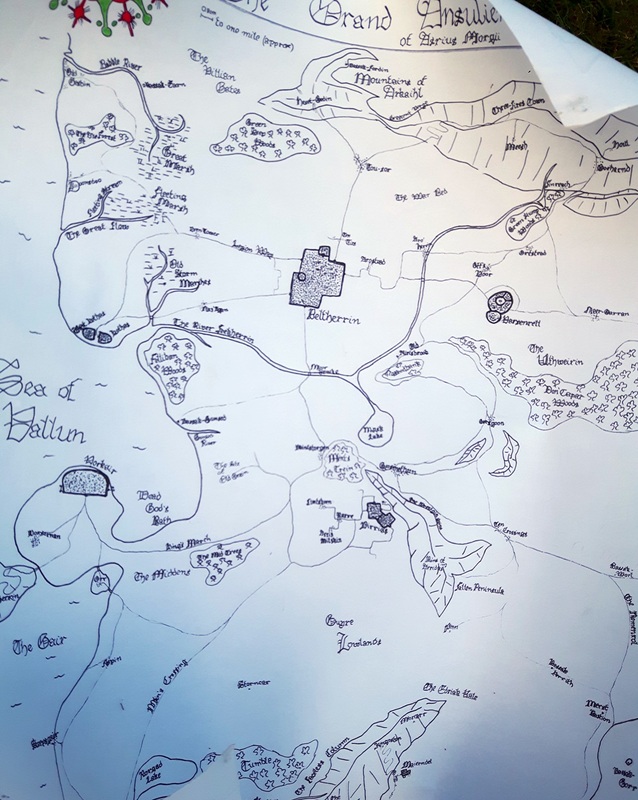 I wrote plenty of equally awful stories following on in the same fantasy universe up until the age of sixteen or so, this map must be related to one of the last ones that I wrote. 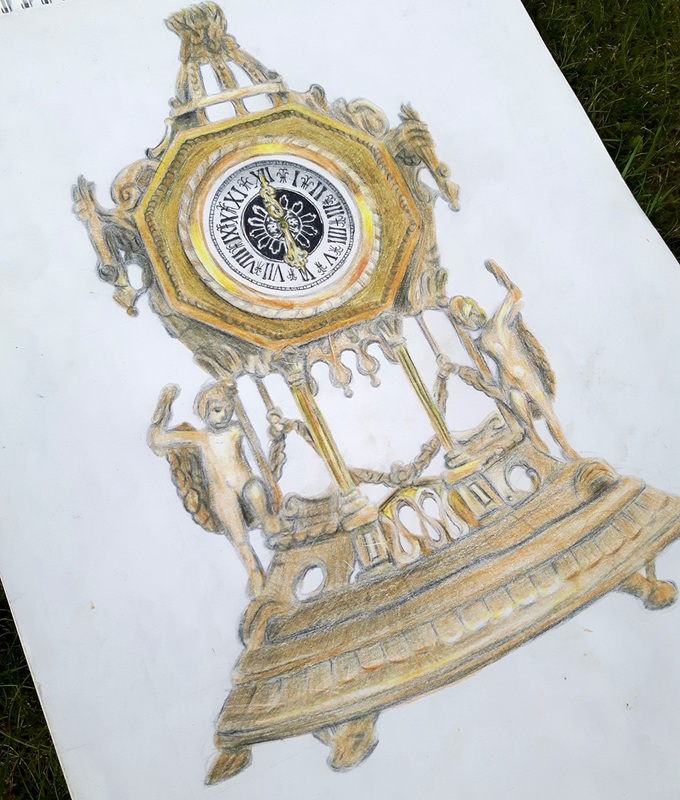 After that I went back to more conventional drawings, including this clock. 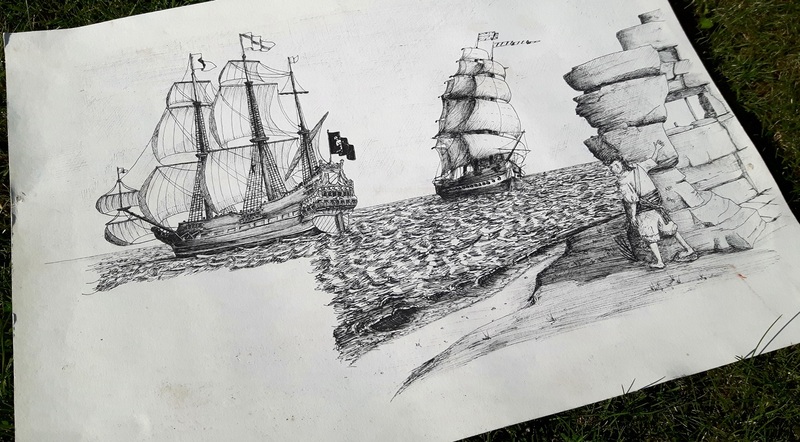 Then I began working with pens – this is a drawing of some pirates I drew to impress a girl I liked, I think I was about seventeen. Can’t say it worked, but at least I’ve got a fancy doodle. 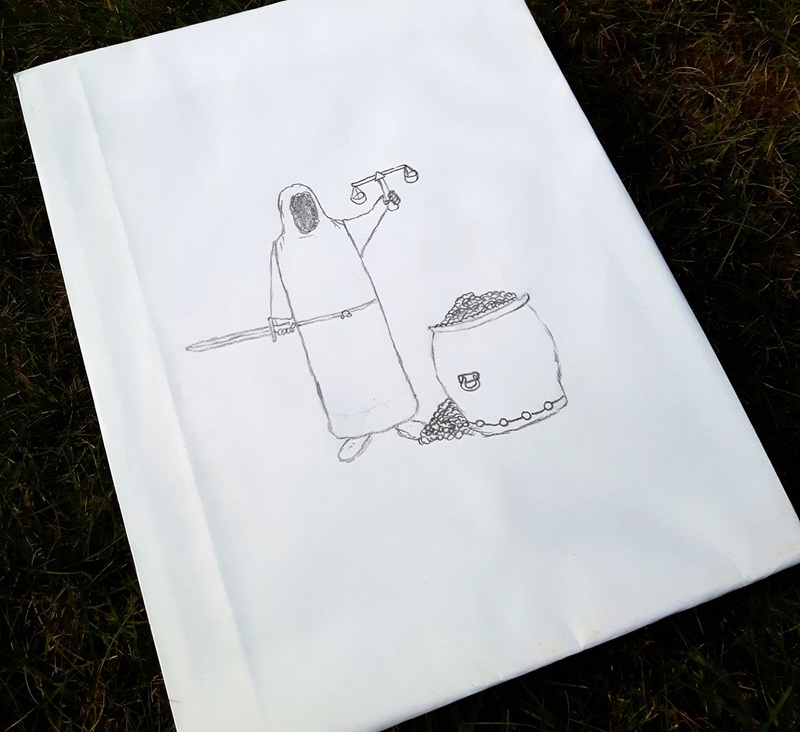 And finally, this drawing dated Aug. 2011 would have been when I was 19, just before I went off to university and began filling up sketchbooks rather than odd scraps of paper (I suppose that’ll be a blog post one day). This and the previous one are re-creations of historical scenes from a bit of research and a lot of general guessing. Something that’s come to be a majority of the drawings I produce. I own plenty of old books that have at some time or the other been the textbook of an unhappy schoolchild or two, and their bored doodles and sometimes even their homework cover lengths of battered page-margins. That is almost certainly true of my next book in these little stories of my library: The Pantheon, Representing the Fabulous Histories of the Heathen Gods and most Illustrious Heroes. I can’t say exactly when it was printed – the first and last few pages have been ripped out apparently a long time ago, but surprisingly the cover is pretty much completely intact. 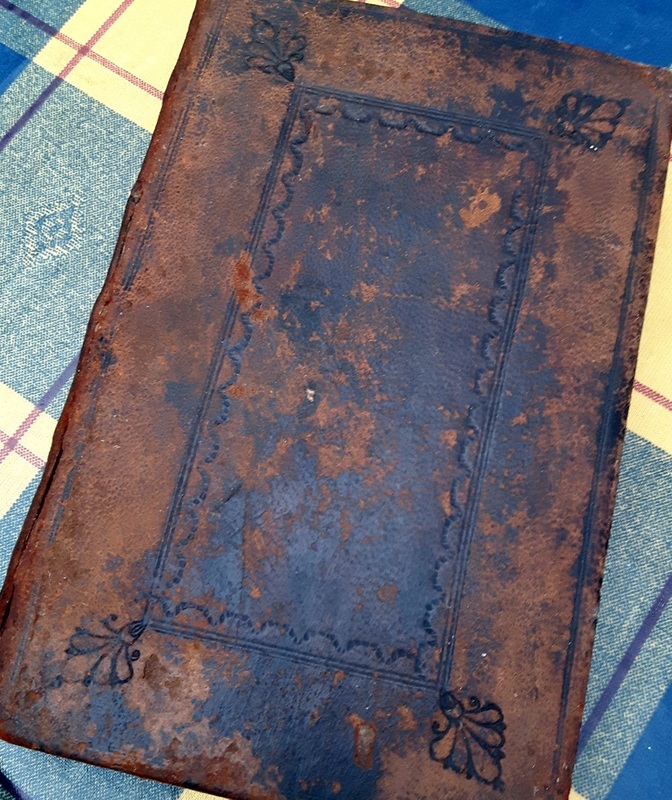 The binding stylistically is of the last quarter of the seventeenth century, being a single-tone panel binding, but the style of it is simple and it could easily be an early 18th century binding done by a country binder as a cheap but hard-wearing piece of work. 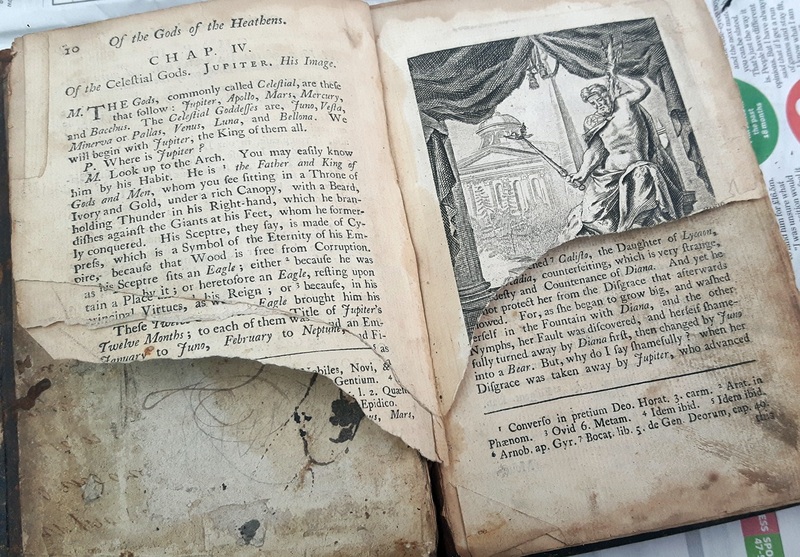 Indeed it needed to be hard-wearing; the original owner certainly used this book thoroughly, and it seems to me that he is largely responsible for the state of the book today. 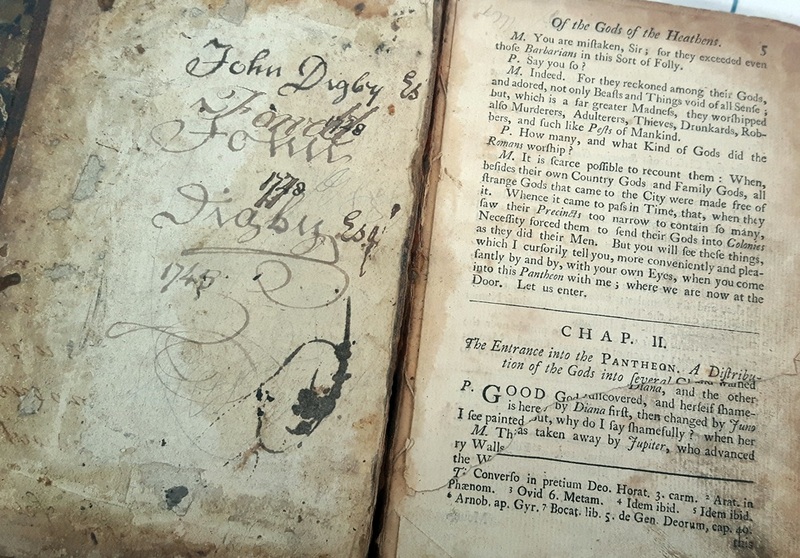 This is John Digby – a mysterious owner who has the handwriting of a young teenager, and filled the front and back paste downs with his name and two years in which he seems to have read the book – 1745 and 1748. Thanks to a hand-written alternative to a bookmark in one margin, we know that on 20th March 1745 he had read up to page 76. 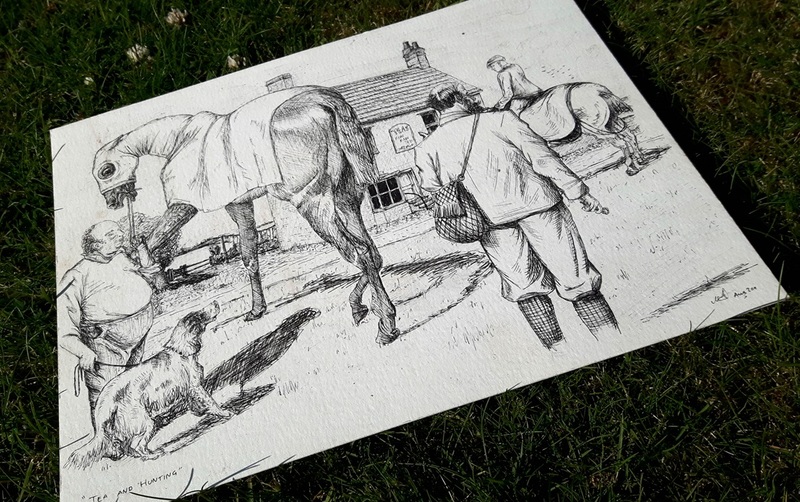 His bored doodles turn up from page to page, and he’s coloured in a few parts of different engravings with his ink pen. 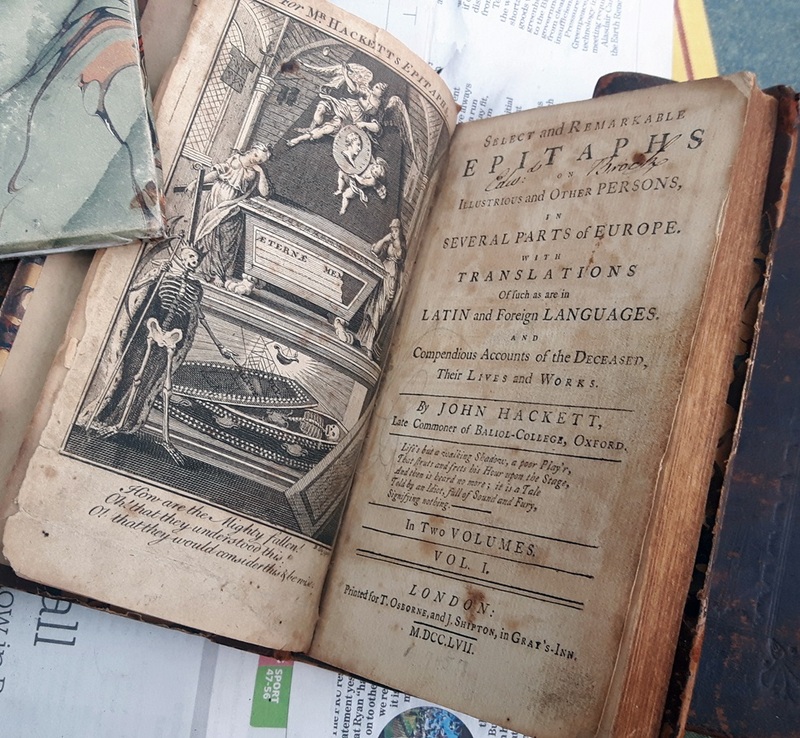 He must have been studying Latin since, even though the book is in English, a short handwritten essay from 1745 appears on the back of one of the book’s engravings, which discusses Theseus and the Minotaur. There’s also several corrections of printing errors, and in one translation of a poem Digby even steps in to fix the rhyming of one line. Aside from him, sadly, there is no history of the owners of this little book. The nibbling along some of the fore-edges shows that it was once kept where mice were running around, and the wear on the boards suggests it has more likely been kept for most of its life on its side rather than stood upright on a shelf. Other than that, there is very little that one can assume about this quaint old schoolbook. You get books on all sorts of subjects – granted my collections attempts to keep to theology, philosophy, poetry, and history – but sometimes an odd subject appears that catches the eye and just has to be read. There’s plenty of these that came out of the bizarre curiosities of past ages, and this next book is one of them – Select and Remarkable Epitaphs on Illustrious and Other Persons. 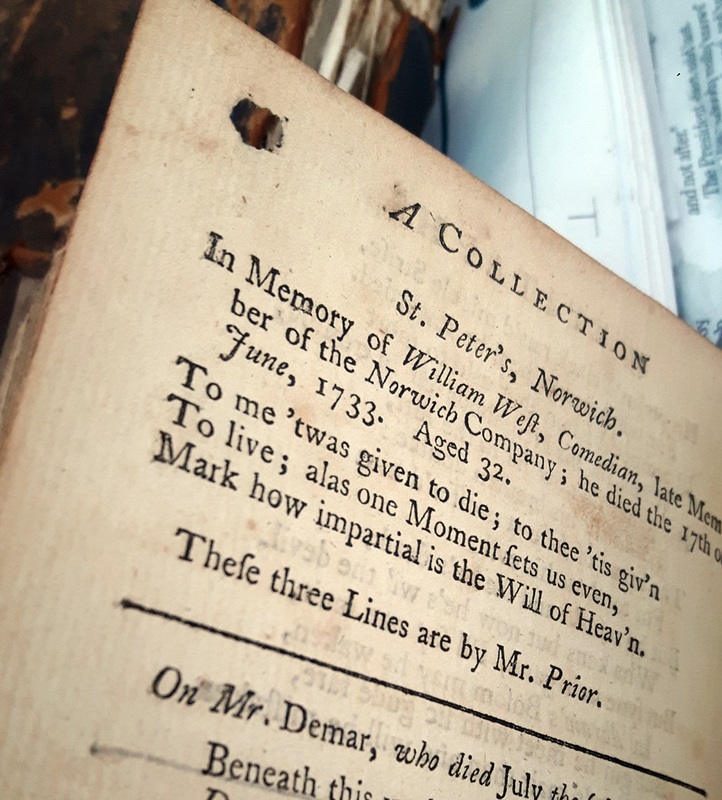 This octavo volume was written by John Hackett, a mysterious antiquarian with a slightly morbid interest in epitaphs who was himself dead by the time the book was published. I own only one volume of the two volume set, a first edition from 1757. And so death lopp’d off me. He there laid him down, and he died in a Sleep. And hither remov’d him to take out his Nap. 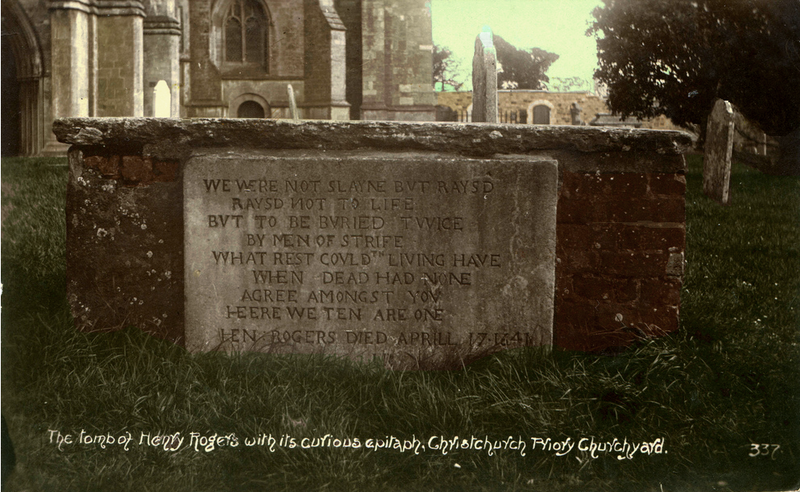 For, egad, had he liv’d, he’d a bury’d us all. 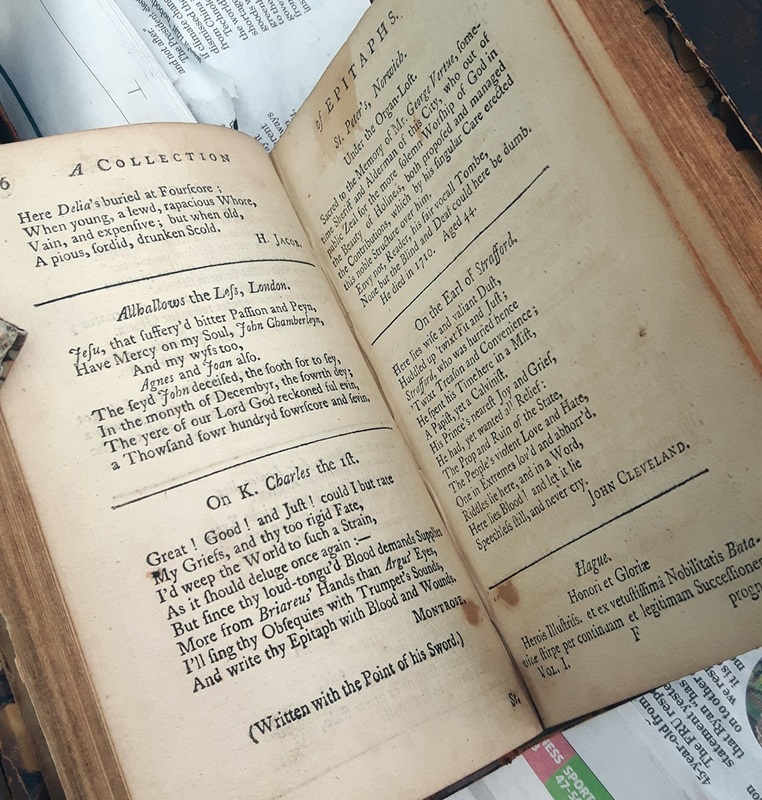 It was printed for Thomas Osborne and John Shipton, two booksellers who regularly worked together in the 1750s to pay for books to be produced, which would then be sold between the two of them. Osborne was the son of a bookseller – a family trade – and had worked with men including Samuel Johnson earlier in his career. At the time he helped produce my book he was working to start shipping some of his stock to the Americas. His partner, Shipton, sadly is far more obscure and it is beyond my minor research to present his history. My copy was owned, possibly originally and almost certainly during the 18th century, by Edward Brock. I can’t tell you much about him either. 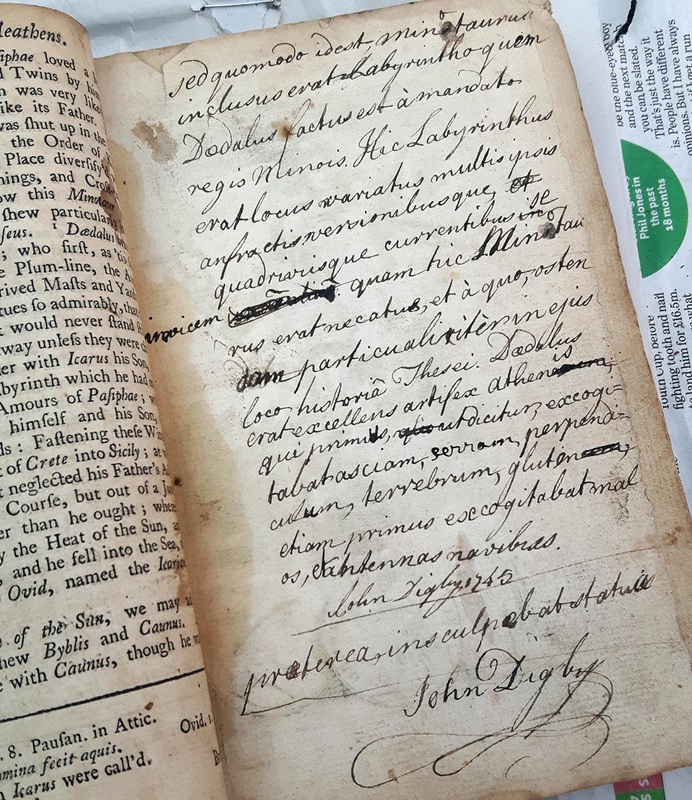 What I can tell you about, though, is the actions of a particularly impressive 19th century bookseller, who has had a good play around with my poor old book. The binding is battered and the hinges tired – it has clearly been well read since this binding was added. Firstly, this is one volume of a two volume set, but the binding has only the title on it and no volume number. Odd, perhaps, for a book that should be part of a pair, but not any real proof that someone has tried to purposefully disguise that its partner is missing. However, at the end of the book where the final page should say end of the first book, the page has been scratched out, making it seem like the book naturally finishes. The most incredible disfigurement, though, appears where page 75/6 should be. These pages have been cut out, but to try and disguise that a very careful circle has been cut into pages 73/4 around the page number to neatly remove it, so that it now takes a double check to see that the pagination is in fact incorrect. 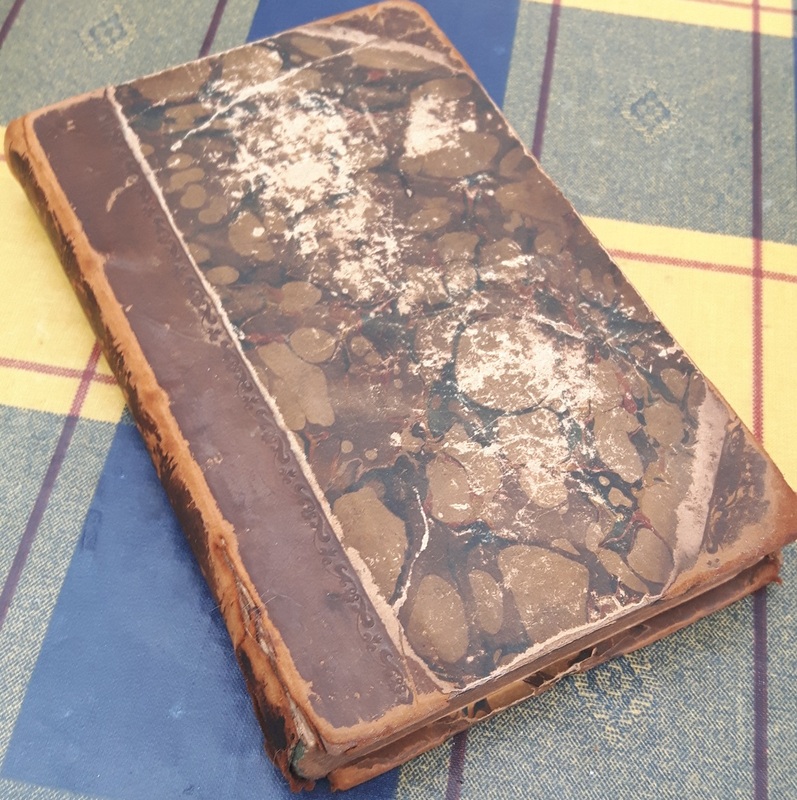 There isn’t any evidence of the book’s history after those changes, but the book is very scuffed and worn – I’ve done a little restoration work on it myself to pull the binding back together. It’s a well read little book and one that, though a truly peculiar and gothic subject, is well worth perusing for the range of odd and sometimes magnificent epitaphs of history’s figures – both well known and obscure.